This amphibious little plane brings James Bond to Scaramanga's island in Chinese waters. Scaramanga uses it as a target, when he demonstrates his solar povered laser cannon for 007. The RC-3 used for the film, S/N 105 was manufactured in 1946. After over 20 years of quiet life it had few accidents, a serious one in November 1971 when it crash landed in a shopping center at Las Vegas airport! In 1974 owner changed to private person, Colonel Claire. 3 months later he refused to loan a plane to Eon Productions, but the Bond producers offered him to fly it to the location during the movie shooting - this offer was accepted. During the film shooting the plane had another accident - It hit a rock with the left float and damaged it - which resulted dissassembly of this part. This had impact on whole film sequence. In the flying shots you can see both floats on the plane, but during the landing the left is gone... Oops.... Due to this issue the landing scene was much more spectacular than planned - The plane could not move slowly on the water due to the missing float. So to keep the wings in level the pilot had to keep quite a speed on the water. So the plane ended with the whole hull up on the dry beach. He got probably injured during this manoeuver. 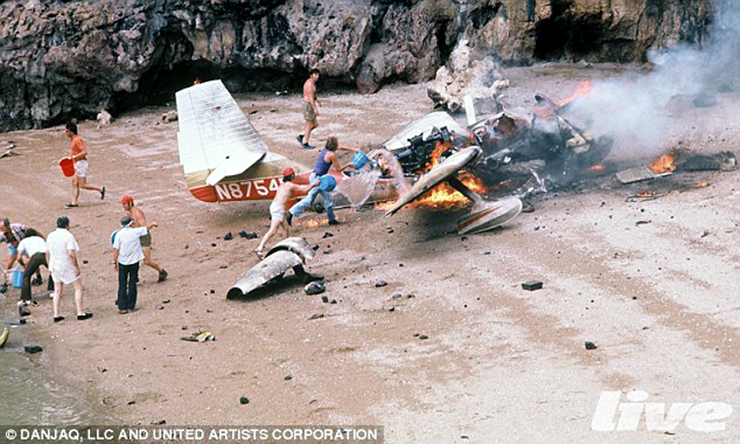 Rumors say that original plane was blown up on this charming Koh Khao Phing Kan island beach - but this is rather impossible, if we take into account that a) plane was not owned by producers b) it flew in 1977 c) was deregistered in FAA in 2012...much later than it should be. So it should be a mock-up. However... picture belows shows it was really damm good mock-up if you check for details. I think it could be next topic to clarify by all Bond and our page fans - as well as RC-3 and other planes enthousiasts.